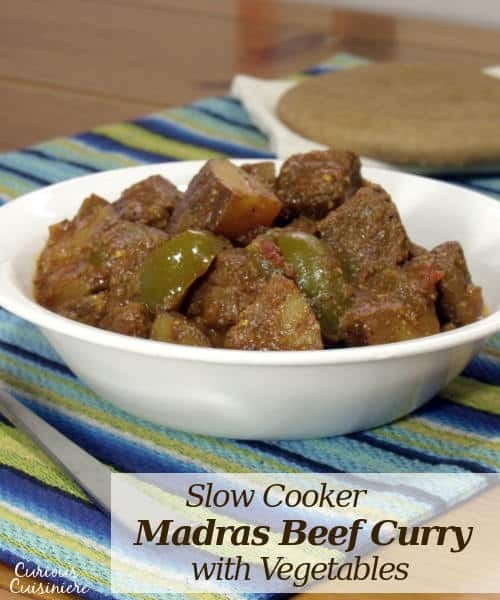 This Madras Curry is a warming dish that is perfect for a cool evening. 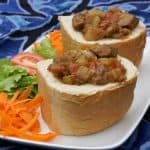 This slow cooker beef curry recipe brings deep, comforting flavors and tender meat with little effort. Disclosure: This post is sponsored by the Certified Angus Beef ® brand in conjunction with a social media campaign through Sunday Supper LLC. All opinions are our own. Curry is such a broad label. Ingredients and nuances don’t just vary between regions, but even between households. We’ve heard it described like pasta sauce in Italy or BBQ sauce in the States. All curries are not alike, and they don’t all have the same spice level. So, if you thought you wouldn’t be a fan of curry because they’re too spicy, think again! If you love heat, you can definitely dial the heat up to your heart’s content. But, if you’re not a heat lover, you can just as easily dial the heat down to a quite comfortable level of flavorful, yet not even glowing. These spices can include anise, bay, cardamom, cinnamon, chilies, cloves, coriander, cumin, fennel, garlic, ginger, mustard seed, nutmeg and turmeric, among others. In Northern India, you will find it common to serve curries with flatbread, like naan. 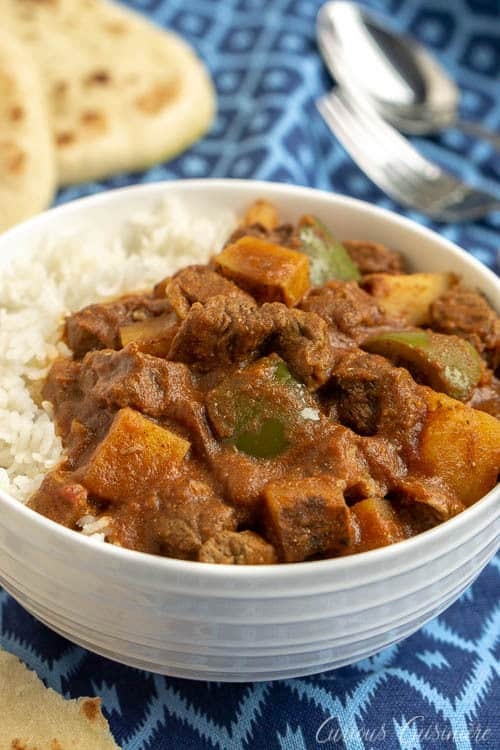 These are the types of curries often found in the US as well, containing a variety of meats and vegetables with dairy (cream, yogurt or butter) to give them a creamy texture. Southern Indian curries lean a bit on the spicier side, with more emphasis on chilies. Lentils are often used, and curries are commonly served with rice. Eastern Indian curries are more savory than spicy and rely heavily on onions for flavor and texture. 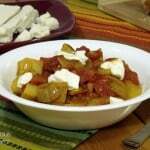 And, Western Indian curries tend towards the spicy and sweet category, favoring a pinch of sugar to curb the heat. These are often served alongside dal, a lentil soup. 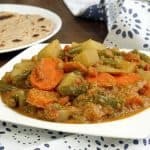 While our Potato Curry with Paneer is more of a North Indian style curry, a Madras curry hails from the southern region, where curries do tend to have a bit more heat. For our Madras Beef Curry, we start by toasting the spices to really bring out the flavor and fragrance. Could you just throw them into the slow cooker if you’re short on time? We’re already skipping a step by using ground spices rather than toasting whole spices here, so sure, you could just skip the toasting all together. But, it really does add a depth of flavor to the dish, so if you have the time, we highly recommend it. You’re going to be getting out the skillet to sear your meat and saute your onions anyway, so you may as well! 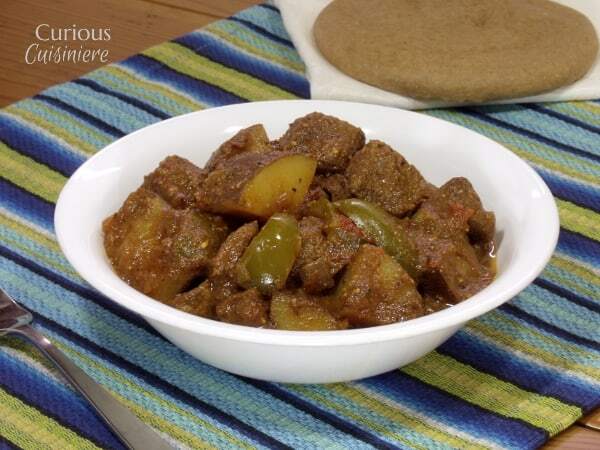 For our slow cooker beef curry we’re using Certified Angus Beef® brand chuck roast. We always look for the Certified Angus Beef® brand logo when we’re buying beef, because we know that they are the only brand of beef that must meet an additional 10 regulations for marbling, size, and uniformity, above USDA grading for Choice and Prime beef. Marbling (the white flecks in the lean muscle of the meat) is key to getting great flavor and juiciness. More marbling means a higher quality! 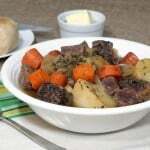 Chuck roast is the classic roast you would choose for pot roast. It becomes super moist and tender when braised low and slow. 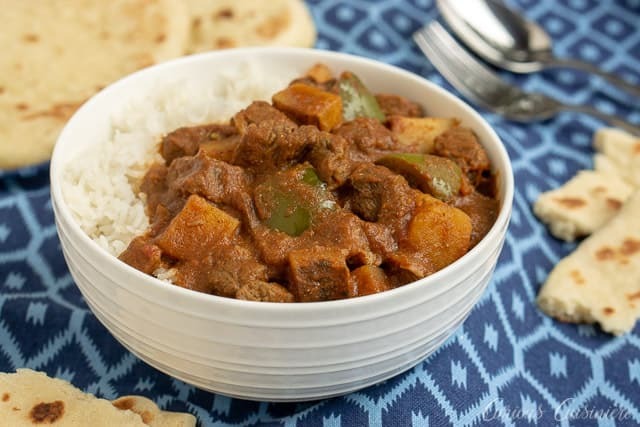 Even though we’re cutting our roast into bite-sized chunks for this curry, we want it to be super tender after the time in the slow cooker, and a chuck roast is the perfect (and quite economical) choice here. To really add to the flavor of our curry, we sear the cubes of beef before putting them into the slow cooker. This seals the juices into each piece, and adds another layer of caramelized flavor to the dish. 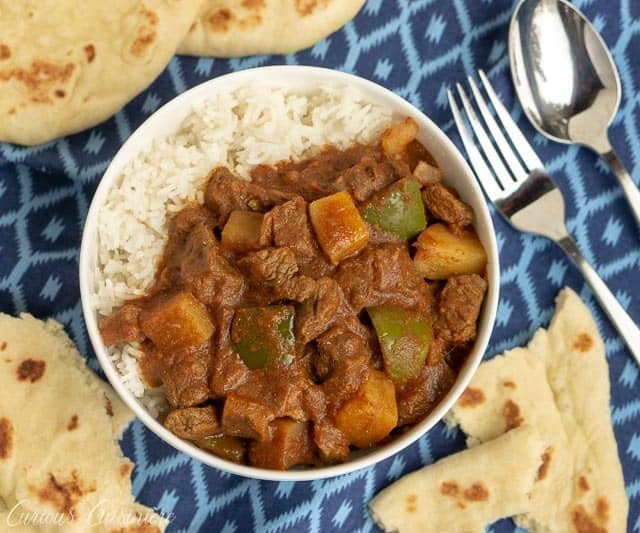 After just a few prep work steps in your skillet, the crock pot takes over, letting all the flavors of this beef curry simmer and stew together. And, while it cooks the aroma of all those warming spices makes the house smell WONDERFUL! Just before serving, we stir in some yogurt and a little lemon juice into the curry to add a pop of bright flavor to the deep spices and bring a creaminess to the dish that contrasts nicely with the spice of the chili powder. 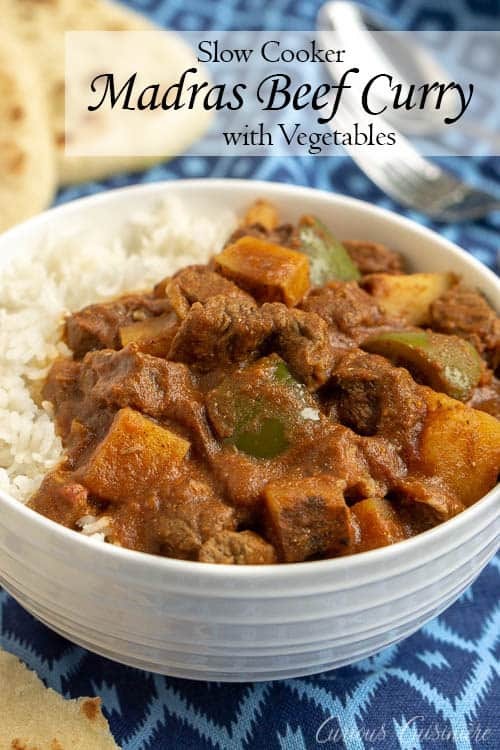 This Madras Curry is a warming dish that is perfect for a cool evening. 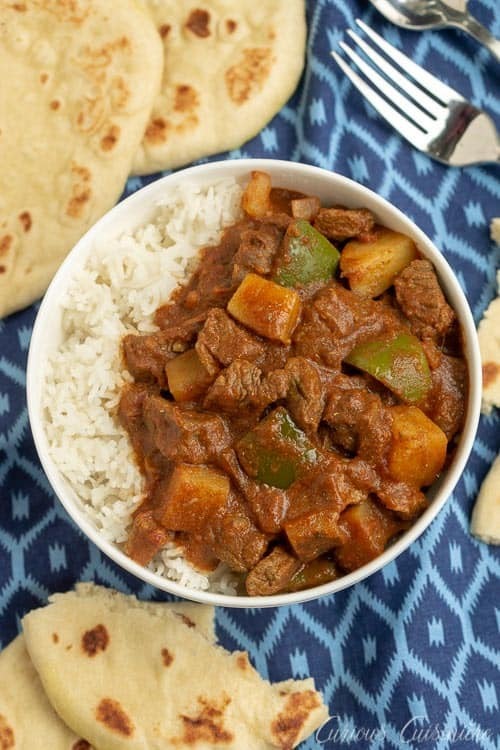 This slow cooker beef curry brings deep flavors and tender meat with little effort. In a medium skillet, toast spices (paprika, chili powder, garam masala, ginger, cumin, turmeric, and cinnamon) over medium high heat until fragrant, 3-4 minutes. Remove from the heat into a bowl to avoid burning the spices. Place half of the beef cubes in the skillet and brown on all sides over high heat, 4-5 minutes. 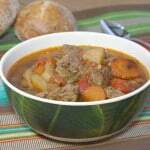 Place the browned cubes in the bowl of your crock pot, and repeat with the remaining cubes. Add oil or ghee to the skillet along with the diced onion and garlic. Sauté over medium high heat until golden, 3-4 min. Place in the crock pot over the beef. Add the toasted spices, potatoes, green peppers, tomatoes, salt, pepper, and brown sugar to the slow cooker. Mix the beef stock with the tomato paste, to dissolve the paste. Pour over the ingredients in the slow cooker. Cover and cook over high heat for 3-4 hours or low heat for 6-7 hours, until simmering nicely. Before serving, mix in the yogurt and lemon juice. Cook for an additional 10 minutes to warm through. Serve withrice, Naan or other flatbread. 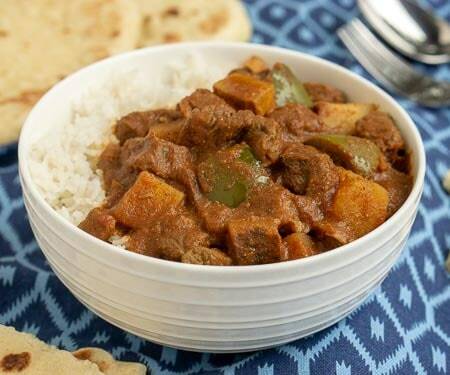 *1 Tbsp of chili powder gives this curry a light, warming heat. If you love spice, feel free to dial it up to your preferred spice level. 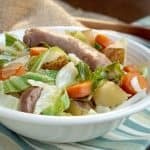 This recipe from 2014 was updated in January 2019. We made a few tweaks to make the curry even better. Enjoy! 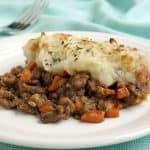 We’ve updated our pictures since we first shared this recipe on Curious Cuisiniere, but we’ve left some originals here, in case you’ve found us in the past and are looking for that old, familiar image. 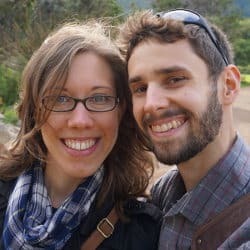 We love our curry here! this looks so yummy! I love those flavors in there! Curry is one of my favorite spices, but I haven’t used it with beef before. I can’t wait to try this one, looks delicious! My go-to meal is curry. Seriously, you cannot go wrong. This looks so good! 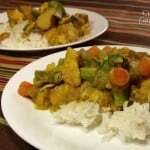 Curries are great in the slow cooker, thank you for sharing this one!! I always forget to use my crock pot in the summer…but it would be so much better than turning on the oven! Your beef sounds terrific…and I bet you were teased with the aroma as it cooked all day long! The aroma is the best and worst part! Now this is a curry dish I could really sink my teeth into. 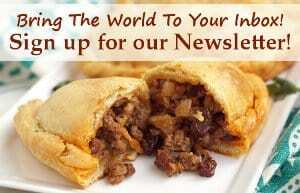 And thanks for the info about the different Indian curries and regions. Very helpful info.